Casa Álamos is a smallscaled, cosy and intimate Bed & Breakfast situated in the stunning county Ribagorza, centrally located in the heart of the Spanish Pyrenees. The very old and rural situated house is the ideal central starting point from where you can start your discovery of this unknown and unspoiled mountain region; there are so many ways to discover it. On foot with numerous stunning and challenging hikes in an endless landscape. By car or motorcycle, taking you to interesting and unexpected hidden highlights. Or treat yourself to a demanding and challenging outdooractivity. As well as these activities, you can also relax and enjoy the breathtaking silence and the Spanish sun on our terrace. Just sit and read all about typical Spain and the Ribagorza, in company of a good glass of wine. Our old farmhouse is over 450 years of age and is located in Visalibons, one of those authentic Aragonese mountain villages, at an altitude of 1100 metres. 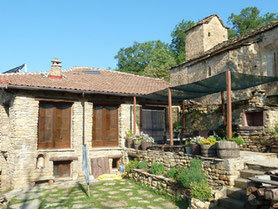 Adjacent to the Romanesque church the building is raised in sand coloured natural stone and hard oak beams. From the outside the house looks rustic, simple and old; but also strong and brave. On the inside it has make a surprising and comfortable residence. During the restoration of the house we tried to save as many original details as we could and we made a huge effort in bringing a high level of comfort in the house. 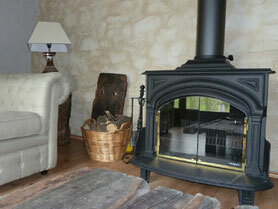 The use of ecological materials guarantee a healthy ambiance. Not only for ourselves but also for our guests! Nature in all it´s glory plays an important role in Visalibons and that is why we named our rooms after the four seasons. Each with their own coulorscheme. 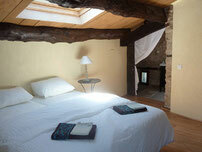 On the upperfloor, under the well restored roof of oak beams we encounter the rooms "Verano" (Summer) en "Primavera" (Spring). These two rooms can sleep a maximum of three persons. 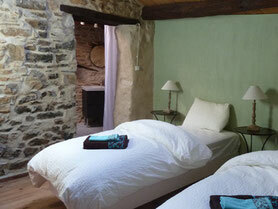 The rooms "Invierno" (Winter) and "Otoño" (Autumn) are situated on the middle floor. These rooms can house a maximum of two. All rooms have their own en suite shower rooms. The box spring mattresses are spacious and with sufficient length and can be posted as double bed or set as singles. Your room can be equipped with additional heathing. On the middle floor you encounter our large comfortable common living room; spacious and furnished with various sofa´s, the honestybar with free coffee and tea making facilities, a large woodburner, and our well stocked reading corner with lots of maps, guides and books on local wildlife and the natural world around you. It is in the living where we serve breakfast and all our home made meals; when weather permits we will eat on the terrace. From the living room you have direct access to a small and intimate garden with both sunny and shaded terraces. The entire lower floor is private space, except for the common entrance. The whole house is free Wifi zone and pets are allowed. 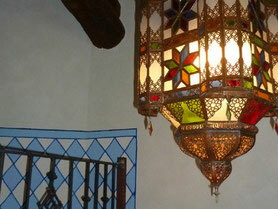 We offer all meals, in a cosy and relaxed athmosphere and a high level of personal attention. 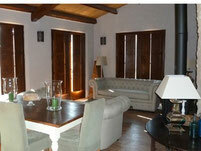 Casa Álamos is available for couples, singles, families and small groups. 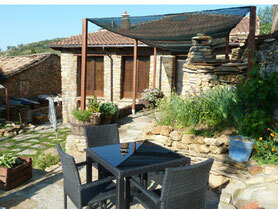 A special vacation in the authentic inland region of Spain does not have to cost you a fortune!